Launceston's new head coach Mike Lewis says his aim is to avoid relegation from National Two South this season. Lewis was appointed earlier this month after the resignation of Neil Bayliss in June because of budget cuts. "We're not going to be finishing near the top of the league because of the situation we've been set," Lewis said. "In a nutshell we are looking to stay in this league, and if we do, we'll be giving ourselves a massive pat on the back," he told BBC Radio Cornwall. 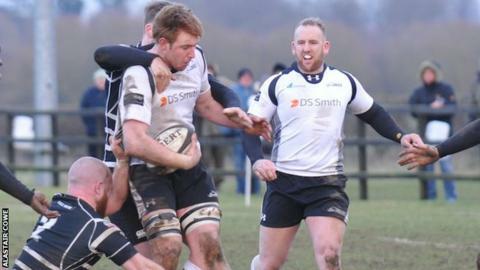 The Cornish All Blacks have re-signed Richard Friend, Jamie Tripconey and Lloyd Duke, although they have seen seven of their players move to National One neighbours Plymouth Albion. "We're chipping away at it slowly," Lewis said of his quest to bring in new players to Polson Bridge. "I only got into the post a week into pre-season, so I've had to do three months worth of organising in a couple of weeks. "Trying to get players in on contracts the day after you've had your budget cut is quite challenging. "We've been working our socks off to try and recruit and training the boys we've already got here."